Evan Bleker of netnethunter.com twitted this interesting Log-scaled price chart of the Dow Jones Industrial Average (INDU Index) from 1900 to 2016 (116 Year Period) and we thought that looking things at the bigger picture really gives us a perspective on what this so-called stock market tops and bottoms. Note though that even given same information, two individuals could have different interpretations/decisions based on their individual biases. But for us at the Filipino Investor, here is our take away from this chart. 1. There will always be a relative top, at any given point in time. 2. 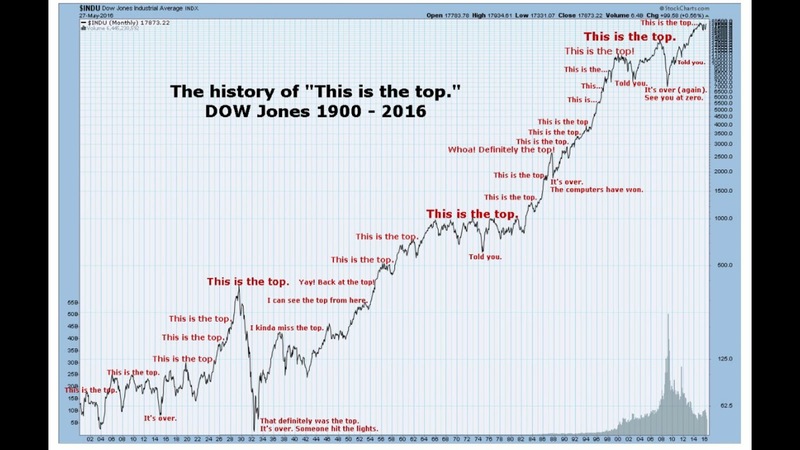 When somebody calls that this is the market top and he is wrong, there is really no one counting on how many times a stock market Top-picker/perma-bear made a wrong call in the past. Which makes it a very convenient way for him/her to make forecasts. And when finally, the relative top comes - Alas! he is a genius and he saw it coming. 3. If you could just invest in the stock market and leave it there and be agnostic of its ups and downs, in the long run you will likely make money as observed in the 100+ years of data. And if you can generate "alpha" i.e. "out performance relative to the benchmark" from investing, then that wouldn't be so bad either. 4. This one is somewhat of a philosophical question, But perhaps we should consider. Is it really worth our precious time worrying about the upcoming relative top, if we have a long investment horizon anyway? Because when framed in the bigger scheme of things it turns out to that those market corrections and crashes actually seems like "blip" along the way. As Peter Lynch have said, If you spend more than 13 minutes analyzing economic and market forecasts, you've wasted 10 minutes.